A couple weeks ago, when we lamented the fact that the people who raised us and claimed to love us still didn’t find it in their hearts to provide us with the specific food products we yearned for (basically, we are all the Honest Toddler on the inside), I remembered yet another item on the denied list which was quickly added to my Writ of Grievances with my progenitors that I will carry with me to the grave and blame for all of my misfortunes, like that Amazon reviewer who said my cookbook was “tantamount to culinary fanfic.” Just kidding, I just took too many melodrama pills this morning. But I do clearly remember a friend’s dad making us the most glorious thing for breakfast after a sleepover: cinnamon swirl toast with salted butter. The slices came from a package of bread with a brand name on it that we had in our own home, but only the whole-wheat kind, and as the full extent of the betrayal crystallized in my mind, I realized that this meant that my mother would go to the store, see the cinnamon swirl varietal on the shelf and reach past it for the one that tasted like sad. I expressed my disappointment made my case to my mother when I got home but I was ineffective in convincing her that sugary cinnamon raisin swirl bread was an essential part of my daily nutrient intake. Almost 30 years later, I’m mostly over it, really. Okay, I’m not. I mean, what if it had been made with 100 percent whole grain sandwich bread? Who could argue with the virtues of homemade bread with everything from whole wheat to rye, barley, oats and brown rice flour in it? And surely, something so unquestionably earnest deserves an inner spiral of indulgence, just one tiny little ribbon of joy. Surely, a slice of such a glorious thing popping out of the toaster tomorrow morning could make up for all sorts of hardships, like the fact that it’s still not spring outside, or why is someone climbing on my head before the sun is up? Surely, you’re not going to deny your inner or outer child this, not because they might whine about it on the internet in a few decades (cough) but because it’s spectacularly good — all the aroma of cinnamon buns baking, none of the nutritional void. Note: From the comments over the years, I’ve heard that man people prefer this with 2x the cinnamon-sugar filling for a more classic, luxurious flavor. No need to double the egg, however. Make bread dough: In the bottom of large mixing bowl, combine water, milk and sugar or honey, then whisk in yeast until dissolved. Add egg and oil and whisk until combined. In a separate bowl, whisk together flours, grains and salt, then add this to the yeast-egg mixture. If mixing with a machine, combine with paddle attachment at the lowest speed for 1 minute. If mixing by hand, use a large spoon and stir for 1 minute. The dough will be wet and coarse; do not fret. Let it rest for 5 minutes. 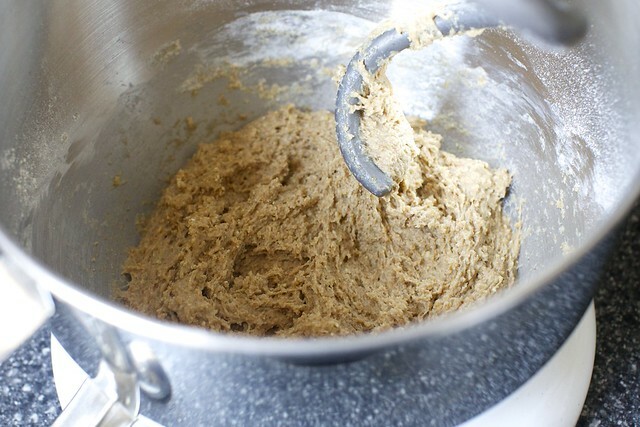 If using a mixer, switch to the dough hook and mix the dough on medium-low for 2 more minutes. By hand, do the same with your spoon. The dough will seem firm and more smooth, ideally supple and sticky, but if it’s still very wet, add a bit more flour, a spoonful at a time. If it seems excessively stiff, add a little more water, a spoonful at a time. Continue to mix with dough hook or by hand for 4 minutes. Scrape dough out onto lightly floured counter. Knead a few times, then form the dough into a ball and let it rest, covered by the empty bowl upended over it, for 10 minutes. Repeat this process — kneading a few times, then resting for 10 minutes — two more times. Proof dough: Transfer dough to lightly oiled bowl with room for dough to at least double. Cover with plastic wrap and let proof at room temperature for 60 to 70 minutes, until doubled in bulk. 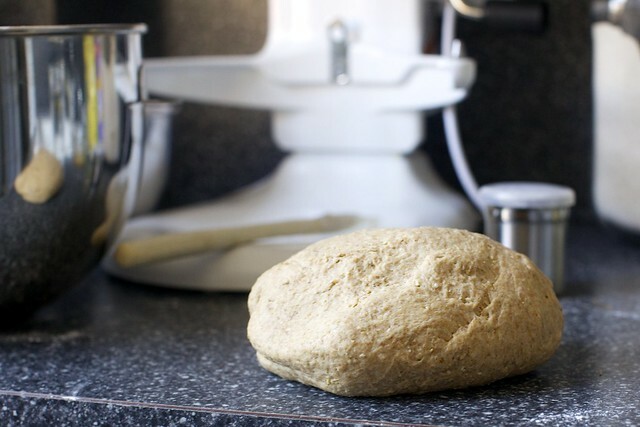 Dough can also be fermented overnight or up to 4 days in the fridge. If proofing in the fridge, remove the dough before the fridge about 3 hours before you plan to bake it. Prepare filling: Combine the sugar, cinnamon, raisins or currants, and flour in a food processor or blender, processing until the fruit is chopped. 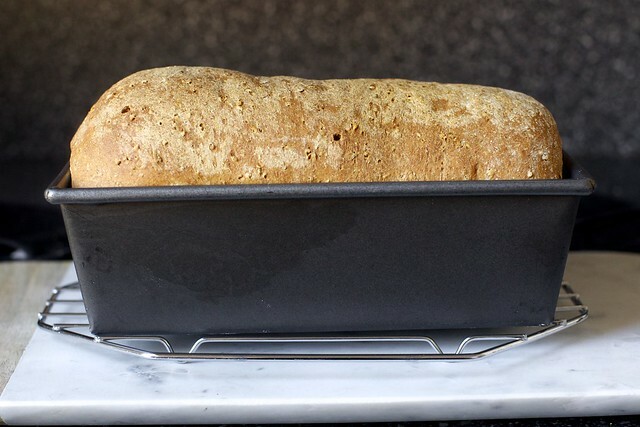 Fill bread and form loaves: Turn out onto a floured counter and divide it into two equal pieces. Roll each into a long, thin rectangle, about 16-x-8 inches. Brush the dough with the beaten egg and water mixture. Sprinkle half the filling evenly over the egg. Beginning with a short edge, roll the dough into a log. Gently press the side seam and ends closed, and place the log in a lightly greased loaf pan. Repeat with remaining dough and filling. 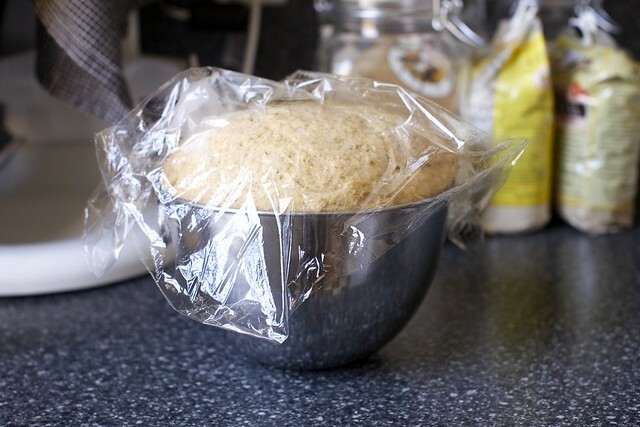 Proof bread again: Cover the pan with lightly greased plastic wrap, and allow the bread to rise for about 1 hour at room temperature, or until it has crowned about about 1-inch over the rim of the pan, about 45 to 60 minutes. About halfway through, heat oven to 350°F. Bake bread: For about 40 minutes, rotating the loaf once for even color. When done, it will sound a bit hollow when tapped and the internal temperature will read 190°F. About this bread: I’m long overdue to share a 100% whole wheat sandwich bread with you and this is a great one. [I shared a Light Wheat Bread with a mix of whole wheat and white flour nearly five years ago and promised to come back with a full-grain one but then I went and had a kid and then a cookbook and my brain hasn’t really worked right since.] You could entirely forgo the cinnamon swirl and make a lovely loaf, perfect for sandwiches. But why would you do a thing like that? About the cinnamon swirl: From King Arthur’s baking blog, I learned a great trick — brushing egg, instead of melted butter, over the rolled-out dough to adhere the cinnamon filling. While butter causes separations in the spiral, egg helps it stay together once sliced. They found that grinding the filling a bit helped it adhere, as well. Whole wheat versus white whole wheat flour: Either can be used here. I opted for the regular, darker stuff, but if you’re new to whole wheat baking, white whole wheat which is from a paler, more delicate variety of wheat, leading to less gritty, more delicate baked goods. I usually use King Arthur Flour’s version. Which whole grains to use: Peter Reinhart suggests any of the following for the 160 gram (he recommends measuring grains by weight) portion: rye flour, rye meal, rye flakes, cornmeal, cooked grits or polenta, rolled oats or oat flour, amaranth, uncooked ground quinoa, cooked whole quinoa, quinoa flakes, whole or ground flaxseeds (he recommends limiting this to under 30 grams of the mixed), or cooked brown rice, bulgur or barley. My whole-grain mix: For the whole-grain portion of the recipe, I used about 2/3 of the weight (100 grams) in 7-grain cereal mix and 1/3 the weight (60 grams) in dark rye flour. Standing in the grocery aisle, I’d been plagued by indecision about which new grains to buy, not wanting to further stuff the cabinet with ingredients I may not use up quickly, when I spotted the 7-Grain Hot Cereal from Bob’s Red Mill and had a “a-ha!” moment. Containing whole grain wheat, ryes, oats, barley, brown rice and oat bran finely enough ground that it could be added to a dough without precooking (it requires all of 10 minutes on the stovetop, cooked as cereal), this will be my new way of bulking up bread with whole grains without having to actually invest in 8 additional canisters, and it tastes great here. Recipe weights: Peter Reinhart uses slightly different weights for his ingredients than I do and I default to his here, in case you were the type of person to notice these tiny discrepancies. I tested the recipe with his; they work as perfectly as you’d expect. To halve this and make one loaf: Halve each ingredient. The only part that will be a headache is the egg. Beat it until loose and fluffy and carefully pour the first half into the bread dough. You can use the second half to for the filling portion. To make this without milk: Just use water in its place, or soy or rice milk. However, the milk makes the bread more tender and golden, so only skip it if you must. Looks delicious! That dish that is half wood half ceramic looks beautiful. Can I ask where you got it? Ana — I found an unused g.c. to Shop Terrain and ordered it last week. Score! 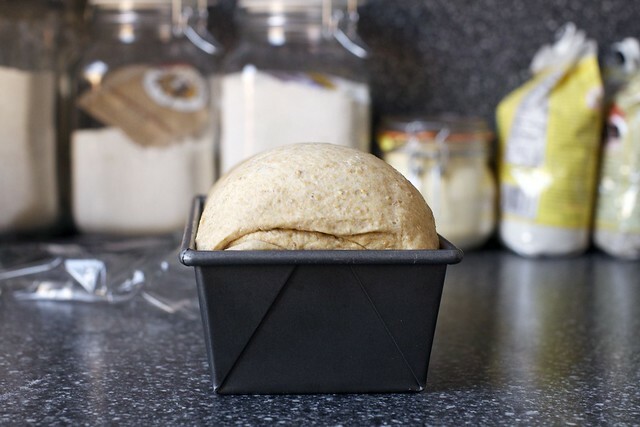 Do you have any specific suggestions for making the dough in a bread machine? Sunday breakfast written all over it. YAY. Oh, Deb. “…the one that tasted like sad” killed me. My husband told me that when I make sandwiches for his lunch they taste like love, but when he makes them, they taste like hate and contempt. He almost did it with a straight face, too. But somehow I still continue to make the lunches….. Recipe looks great, can’t wait to try it out. I love your cookbook and the “asides”… at least you got wholesome food while growing up… my mother hated cooking so unless you could boil it in a bag or cook the daylights out of it, it wasn’t served… I’ve loved cooking all my life and I think your foray into cooking was much like mine – for me, there HAD to be something out there other than canned mushrooms and (gag) butter beans… Moved to California 43 years ago, bought Julia’s cookbooks and was off and running… made a souffle having never had one in my life… Now retired and living in Scottsdale and having produce all year around is wonderful… I’ve given your cookbook to friends and my daughter loves it… she’s visual, like me and the pics are wonderful and inspiring!! Do you have any suggestions for those who don’t like dried fruit? Could the raisins/currents just be left out? I wonder the same thing. I am assuming leaving them out is no problem, because in her notes she said the entire swirl could be left out to make wonderful whole wheat sandwich bread. I am assuming this means that the swirl could leave out the fruit. I am going to try it without because my sons hate raisins (and currants). I love cinnamon swirl bread! I’m going to go make this right now!! Oh…MY!!! This is happening in my house immediately. I ADORE warm cinnamon raisin bread with just the smallest of salted butter smears, but I never buy it because I’m trying to be all “healthy”. Oh Joyous Day! Cinnamon roll smell without all the guilt? Sign me up! I love the trick of using egg to help the filling stick. It always makes me sad when the filling spills out while I’m rolling it up. “Tasted like sad”–That made me laugh out loud literally! My childhood was the same. Only whole wheat bread for toast. Though Mom did make delicious biscuits for breakfast on the weekend. I’ll have to try this soon! Oh, there are a lot of cinnamon lovers in my family who will love this! My husband has an especially soft spot for anything cinnamony and sugary, so this is a nice, healthy alternative for his breakfasts! D’oh, nevermind my comment, rereading I noticed the raisins are there. I just started making bread recently (it started as a cost-saving measure but ended up being one of those things where we just couldn’t go back to store-bought preservatives once we realized the magic of real bread…but I digress). My instant yeast says to never let it touch liquids until it’s already mixed into dry ingredients. Should the recipe show active dry yeast? Or is there some magical thing going on here that the instant yeast jar didn’t tell me? 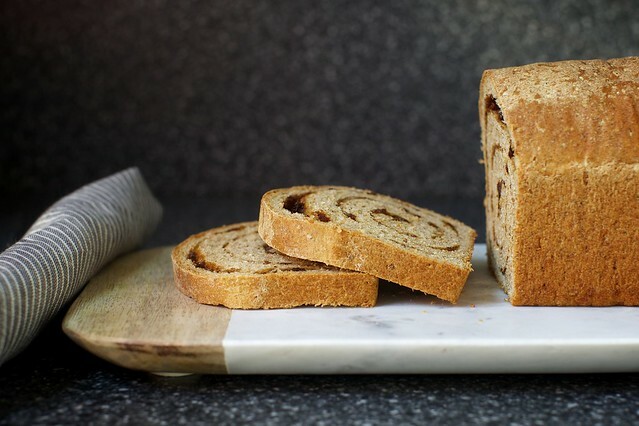 This is the third cinnamon swirl bread recipe I’ve seen in two weeks, I have all the ingredients at home (and have been looking for a use other than cereal for that 7-grain cereal), and needed something to bring to the next food swap I’m going to. The trifecta of signs. America’s Test Kitchen had an interesting solution to the gaping with the filling–they rolled it, cut the loaf in half lengthwise, and then braided/twisted it. Apparently this meant less chance of gaps with straight rolling and the filling ended up being more evenly distributed. I think the pictures are still available for free on the site. Can I come over to your place for some?! :)) I love the tip to brush egg, instead of melted butter, details truely make a difference! Thank you for the recipe. The photo labeled “second rise” kills me. I love it. A beautiful loaf perfectly risen, ready to go in the oven and make the whole place smell like rainbows and hugs… I want that picture in my kitchen. This looks great and I will try my hand at it today. Deb, do you have any advice for me if I want to used freshly ground flour? For instance do you know if I need to add gluten and lecithin? I know you didn’t do that but you seem like you might know something like that. I really enjoy your blog! Rebekah — Sorry, I haven’t any experience with freshly ground flour. Did you mill it yourself? I’m so impressed, either way! Katie — Yes, this is Reinhart’s suggestion. It sounds finicky but you actually barely knead it with this technique, probably less than 2 minutes total. The resting does most of the work. So, it’s a pretty neat technique to consider vs. the usual “knead for 5 to 10 minutes” kind of thing. That said, I don’t think much harm would come of just kneading it the traditional way (longer, no rest, then putting it right to rise). Kathi — Hm, I’m not sure; I have never heard of an instant yeast brand forbidding mixing with liquids and Reinhart, who is probably one of the world’s best known bread experts, doesn’t give any warning about certain kinds. Instant yeast is traditionally added directly to the flour, no need for proofing, however I suspect that Reinhart is using this warm water + whisk to dissolve step because he (as do I) finds that instant yeast takes forever to get started. (I find that it takes longer to start rising than Active Dry; i.e. the “instant” part is that you can use it without proofing, not that it’s faster.) Here, it takes off quickly, saving you time. Phin — Ha! Good memory. I’ve caught him eating raisin things several times since the kid was born. I think he’s over it. Skipping the raisins — Yes, you can. Christina — Thanks! Whole-heat sounds so much more enticing, really. Ellen — Sadly, I haven’t used a bread machine before. But I’d probably go and Google up a bread machine cinnamon-swirl bread recipe that’s got good reviews, and use these ingredients and proportions instead. I.e. use the times and settings suggested. Hope that helps. You hit my weakness, Deb! Cinnamon baked goods of any kind, really: bread, muffins, buns, danishes. Thanks for the egg wash over butter trick so the layers don’t separate! This looks so tasty! I am going to make this weekend. Your posts always make me hungry. Beautiful! Looks great. I’m wondering if you think an applesauce sub instead of butter/oil would work? 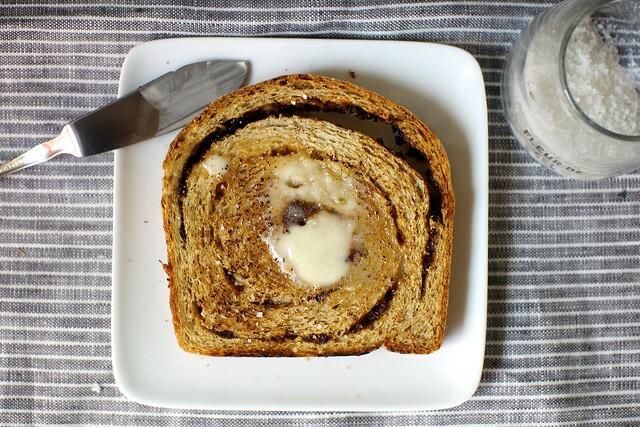 I never even thought about making cinnamon swirl bread, especially as a whole wheat bread. So glad you posted this! We would actually get that bread on occasion, probably when a coupon was involved, and it was heaven. But of course I’d never feed my kids “junk” like that. Poor little guys. I will, however, make this immediately. I like Reinhart’s whole grain recipes, but find that for things I want Right Away, they’re not the best. Like this bread. I want this. Now. Thanks! I am so making this. Right now. This bread looks absolutely perfect! Deb – I was (am) fortunate enough to have a grandma who has a tried and true family recipe for cinnamon swirl bread (a white flour one!!) that showed up on the breakfast table at holidays and family gatherings. I love it. Someday, when i’m feeling a little guilty about all the refined flour, i’ll try this one. But i’ll tell you that’s not likely to happen any time soon! However, what i DID make last night was the Giant cluster maple granola from the Book, and holy heaven!! I made a double batch, and judging by the amount i have managed to consume today by the handful and in yogurt, i think it’s a good thing. I didn’t have a whole cup of shredded coconut, so made up the difference with sunflower seeds. I also used half walnuts and half almonds for variety. That granola is PERFECT. Thank you!! You, with the egg white, genius!! And thank you for saving me from stirring a pan of granola every 10-15 minutes for 75 minutes. Trader Joe’s has whole grain cinnamon raisin english muffins that I’m obsessed with. I’ll have to try this recipe. Thank you! This post cracked me up. I have the house to myself tonight and am going to spend it making this bread while listening to an audio book. Remember when Friday nights were all about going out? Ha. Since you can substitute honey or agave for the sugar in the dough, I assume maple syrup would also work? I’m going to try it. If you paint the bread with beaten egg, it will help keep it from pulling away when it rises after you roll it. The protein in the egg acts as a kind of glue. All the glory and none of the guilt! Perfect! I can’t wait to try this recipe out! Deb, your idea about using the 7-grain cereal is truly brilliant! 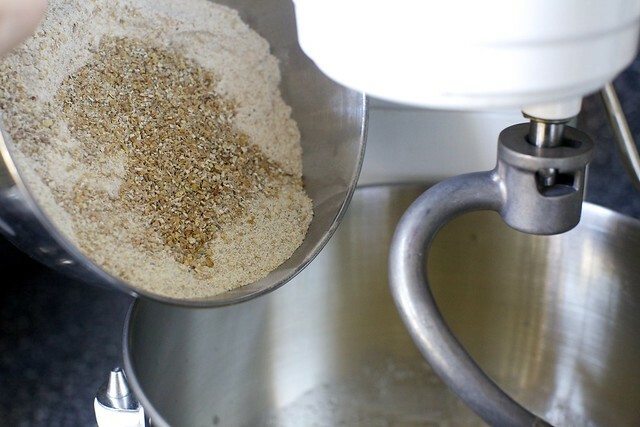 Not only do separate flours take up room, they also are very expensive. Thank you, thank you. Deb, this bread looks absolutely amazing and I want to bake up a loaf for the weekend! Would it be possible to substitute active dry yeast for instant? I assume that the rising times would be a bit different but would it alter the end result at all? Ooh, I love cinnamon raisin bread!! I’ve never tried making it on my own (my parents have a bread machine that I sometimes use when I went home to visit), but this looks simple enough. For some reason, baking bread from scratch has always been one of those things I’m intimidated to try…thanks for the recipe (and boost of confidence)! I made a cinnamon raisin bread similar to this a couple of months ago (read: not completely whole wheat haha) and it does smell absolutely out of this world while it’s baking! I actually used a bit of milk as the glue for the cinnamon and raisin mixture and I didn’t have any trouble with it separating. I’ll have to try this more wholesome version next… it makes amazing French Toast, as I’m sure you can only imagine. Love that this is whole grain! Yum! Rebekah- I can comment on the fresh ground flour. If it is not sprouted, you don’t need to add any conditioners. The main thing is to use the weight measurements because fresh ground flour is “fluffier” and cup measurements will be less accurate. Beautiful! Also, that trick about the egg wash on the dough, I too have used it – works like a charm! Thank you for a great recipe! Artisan Breads Every Day just arrived in my mailbox yesterday. :) I was looking through the recipes last night and was like, “Hmmm, that whole wheat sandwich loaf looks so promising.” Now I’m going to have to try it since it has the smitten kitchen endorsement! Due to digestive issues, I can’t handle 100% whole wheat anything. I’m not sure whether the additional whole grains would be enough to mitigate this problem. Is there a mixture of white and whole wheat that I could substitute instead of 5 cups of whole wheat (or whole heat, whatever)? I used to make cinnamon swirl bread when I was in high school and thereafter for a number of years. No raisins. My family and I loved it, and I’d love to make a healthier version of that old recipe. I’ve been making bread for years and I can’t for the life of me EVER roll out a rectangle-ish shape. Yours looks perfect! Any tips? Thanks! I recently went through a cinnamon roll phase, due to a horrible experience at a chain mass produced sweet shop. Making cinnamon rolls twice weekly was wreaking havoc on the husband’s diet. (He’d complain, but would ask for it and eat more than one roll at a time with plenty of cream cheese icing.) While I was kneading the dough one session I thought about that name brand raisin bread. I grew up having it in the house, most likely when it was on sale. Which led me to ponder if I every gave my son the joy of that treat. I felt guilty that I never brought that flavor experience into his life. Well my husband told me not to worry. He and my mother had sneaked that experience into my son’s formative brain. He wasn’t that impressed with the bread. Hopefully this recipe will bring him happiness. I love the looks of this whole grain bread. I’ve always preferred whole grain to white bread any day, despite the fact that I grew up on white Wonder bread. :) Cinnamon raisin is one great way to make it extra indulgent…I can almost smell it from here. This will take some time, but looks absolutely amazing. So nice to have you do all the thinking for us ! The 7 cereal mix was genius, not just “a-ha”, this has brought up all kinds of possibilities for inventiveness. I can’t decide why some people have a “food shopping fairy”, and others don’t. Inattentiveness maybe? SOOOO glad that you have one. If you want to go Thrift Shop shopping you are welcome to join me ( I found your much-admired blue pyrex bowl at one)…that’s where my “shopping fairy” lives.Score for me too! Hi Deb. I love the 5 year old light whole wheat loaf as do my two boys. I make it almost every week! While a full whole wheat sounds good too, I wonder: Do you think I can use that recipe with this filing and technique? Thanks. “…that tasted like sad.” Just snorted out loud in my silent apartment and scared the cat. Too funny! Can’t wait to try this fantastic-looking bread! Girl, how do you do this??!! You always come up with the most amazing recipes which we all loved growing up and you make it look so simple!! Loving this recipe! This looks awesome! If I were to make the full recipe and freeze one loaf to bake another weekend, which step would you recommend going until? The second rising and freeze just prior to baking?? Just thinking how awesome this would be as French toast!!!! Thanks for another lovely recipe, Deb. Under ‘which whole grains to use,’ how would the polenta be incorporated? Is it supposed to be cooked polenta? Thanks! Honest Toddler is good stuff, but have you seen Sanctibaby? Some of the tweets hit embarrassingly close to home, but there have been some real gems. Now I am torn – my husband is now officially prohibited from eating whole wheat at all (kidney stones – long story). So if I made this, I’d have to eat it all myself, which doesn’t seem fair somehow. But maybe I should make him something else to compensate and eat this all myself anyway? Have you tried with other grains? Maybe a mix of white flour and other (low oxalate) whole grains? Looks amazing! The Bob’s Red Mill 7-Grain Hot Cereal Mix is also the secret to the Cook’s Illustrated multigrain bread recipe (which I love). this looks amaze-ness!! I was just telling a friend how much I miss the cinnamon swirl bread from my fav grocery store in the last city I lived in!! I will have to try this! thank you!! Thanks for all the lovely recipes and inspiration. Hi, thank you so much for the recipe. Is it ok if I skip the whole grain mix ? Thanks a lot !! Wonderful writing, Ms. Smitten. I suppose, though that the writers of Grain Brain and Wheat Belly would be the deadbeats to take umbrage with this wondrous treat. It’s disturbing too, to read those books. They make a very good case. So what to do with all our lovely grains, especially wheat and it’s 40 year ugly makeover? Maybe between us we can figure out something as yummy like this BUT in some other form? Nonetheless, love your work and keep it coming, especially the humor. And happy Pesach, if I don’t see you! Deb…did you, would you, soak the raisins in warm water (or perhaps warm rum) for a half hour? I find that baking with soaked raisins makes them so much better in the final product. Thanks for another fine recipe. I’ve just started baking bread in the past month when I got tired of seeing my husband throw out grains from making beer. I looked up a spent grain bread recipe and haven’t bought bread since. I will certainly be adding this to the queue. I love the tip about the cereal. That is going on my grocery list immediately! Any experience freezing these loaves? I want to use the bread for my son’s morning french toast, but at a rate of about 1 loaf/week, I’ll need to freeze it to prevent spoilage. Cooks Ilustrated method of braiding the loaves with opened logs makes a gloriously beautiful loaf. I also found great success with their method of using powdered sugar over a dampened loaf in the filling. Not sure if you’ve tried that. I’ll try the egg method this time. Cinnamon Swirl Bread is a weekly favorite I my home. My Challah Cinnamon Swirl makes the best French Toast imaginable. For non-dairy bakers I strongly recommend using Oat Milk if you can find it. Pacific Brand makes it and Whole Foods sells it. I’ve baked non dairy for 25 years and it is the best dairy milk substitute for baked goods. Oats absorb moisture so they help bread loaves hold moisture. Oat milk works perfectly in my cakes as well. I grew up grinding my own flour and have been doing it for years. No need for gluten flour or other additives. Make sure you use hard wheat for this recipe wither hard white or hard red. For things like muffins or pancakes or scones, use soft wheat. You will be amazed. It grinds up soft and fluffy so often you need more than the recipe calls for in cups, but the key to not baking door stop bread is to keep the door wetter and stickier than you would with white flour. Also too much kneading with rye flour causes problems. This recipe is perfect for adding rye like in Deb’s picture. I often make breads with fillings, but I use honey and it will work great in this. If it is too thick just heat it a little. I also use cold, not warm water and cold milk. This is for a slower rise which allows more flavor to develop. Warm is only when I am in a hurry. Modern yeast can be killed by too much heat, but not by cold. Laurel’s Kitchen taught me to make light and fluffy whole wheat bread, it is a genius book. I am no vegetarian and I refer to it frequently. Their bread book si also great, but most of those breads take too much effort for my normal life. The no knead bread can also be made with whole wheat including soft wheat. Do not try regular bread recipes with soft wheat, it is too difficult to work with. Whole wheat home ground has the best flavor and is no more difficult than grinding spices or coffee. I have saved a fortune over the course of raising 3 children. Modern wheat grinders are much better than the old one my mom used. 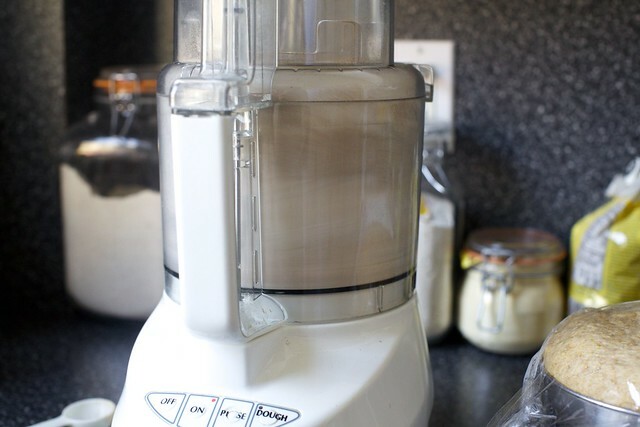 Store whole wheat flour is frequently rancid, make sur eyou buy it very freshly ground. If your food tastes like cardboard that is rancidity and not the fault of baking with whole wheat. 1) Honest Toddler and Sanctibaby are both awesome, and should definitely be a part of everyone’s Twitter home feed. 2) Luckily, my mother was a huge fan of cinnamon swirl bread, so we did have it every few months or so — somehow, though sugary cereals were never allowed, we were allowed pretty sweet baked goods. Does anyone else remember those pecan swirl rolls that came maybe 8 to a plastic package and were oddly greasy? My daughter and i were JUST talking yesterday about how much we love cinnamon raisin bread. I think you’re psychic. Thank you! I made your light wheat bread this week and really loved it (with white whole wheat flour) and I’m thinking of just making that again for the bread part of this recipe, just because I’m not super keen on 100% whole wheat bread. I grew up eating it and it still tastes like sad to me. Also I don’t have kids so I have no one else’s health to think of, ha. Can you think of any reason that wouldn’t work? It seems safer than trying to sub in white flour for part of this recipe. This is the best looking cinnamon bread and recipe I have seen yet. I love this, and won’t have to pay $6 at the Harvest Bakery anymore…love to serve it to my holiday company and may have to keep it around for everyday, too. Can’t wait to try it! I love so many of your recipes!! Right now my faves are the Kale Salad with Pecorino and Walnuts (my son even requested this for breakfast!) and the Hot Fudge Sundae Cake (which I served at my stepmother’s 90th birthday party and she thought it was the best cake she ever had — which at her age is quite the compliment…). I love the high contrast living that seems integral to your blog — kale salad and ice cream cake!! And I just went online and bought that gorgeous marble and wood cheese board! Thank you for the inspiration you share on so many levels. This bread is definitely worth waking up for! I can see why you are still scarred by your parents refusal to make it! It’s like cinnamon swirl bread only BETTER! Hi Deb. Just wondering how this bread freezes. I would love to bring a loaf to a friend later in the week but would not have time to bake it then. This bread is in the oven as we speak! Smells amazing! I’ve never gotten such a good rise during proofing. I did brush the tops of my loaves with some beaten egg just to give it a little shine. Can’t wait to taste it! Thanks Deb for this, your blog, your cookbook, wit and wisdom. I have to agree with that Amazon reviewer…you are a marvel! Hi, Deb! Thanks for the instant yeast info. The only brand available in Vons is Fleischmann’s, and I was not super thrilled with the rise I was getting from it – I agree, it take forever to proof. This procedure sounds way more useful for making happy fluffy bread, and we all want happy fluffy bread, dang it. I’m totally trying this recipe in the morning. I made these yesterday and they turned out wonderfully. I used a combination of uncooked millet, oats, cornmeal and ground quinoa for the measurement of whole grains. I wish I had at least soaked the millet and cornmeal- as it was quite coarsely ground- before adding it to the dough, but the loaves still managed to have a lovely texture over all. I really don’t like raisins, so I omitted them. Thank you so much for the egg wash tip! I have never had such great success keeping cinnamon filling in it’s place before! This is a highly recommended recipe. I totally made this today. And it is totally delicious. I did not add any raisins or currants (no offense against the fruit, just didn’t feel like it). I used a 12-grain flour in the whole grains measure and I think I will do some experimenting next time! Oh and I only had active dry yeast. I used 1 3/4 T and it worked out great. I made it this morning and it was delicious. I used cornmeal and honey for the options. wonderful! I baked the Double Chocolate Banana Bread. It was a HIT! Thank YOU,Thank you! If you have a fan club I am joining. Not only is your blog and cookbook my go-to site for everything amazing, but you never fail to make me laugh. I remember bread that tastes like sad, only mine was day-old rye my frugal grandfather used to buy, and then toasted until you could break a tooth on it. No amount of butter could cure it. Never stop doing what you’re doing. I don’t think we’ve been disappointed in a single recipe of yours that we’ve tried, and we’ve made lots of them! This one goes on my list of must try but I’m pretty sure it can’t top those brioche pretzels! I just love this recipe , I will certainly bake it . Thanks for sharing . my pregnant sweetheart sent me this sk recipe the moment it appeared to the world, and said, “if you love me, you’ll make this for me this weekend.” i did, of course, because i do. followed the recipe save only one sub: i used bob’s red mill 10 grain instead of 7. yum. everyone’s happy. thanks, deb, as always. Just had my first slice of this bread and I am in love! I used quinoa flakes, flax seed meal and dark rye flour for the whole grain mix. I was blown away at how beautifully the dough rose. Teresa — I don’t see why not. Buckwheat, with it’s absence of gluten, can make bread a little sandy, so I’d go easy on it. Ha ha! “tasted Like sad”! I remember well the baked goods and granola that tasted like they had bark on them. Also the health-food peanut butter that separated into a dense, dry mass and a puddle of oil. And the cream-top milk in glass bottles, decades before foodies made it fashionable again. Hurry for health-food moms! Deb Deb Deb!! How did you roll the dough out for the cinnamon filling in such an uniformly 90-degrees, straight-edged rectangle!!!!!!!!!?????? I could stare at that perfect rectangle forever! Did you trim it before rolling? Please, I have to know. One OCD to another you must tell me. 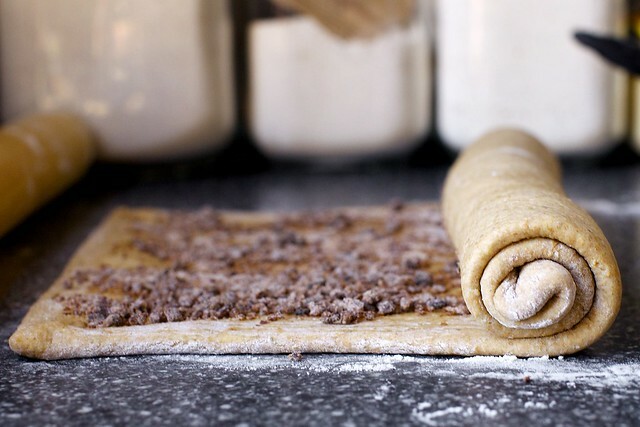 Mandy — As you roll out the dough into a rectangle and little bumps and buldges stretch outside the imagined rectangle, just fold them back in and roll across them. It will stretch the dough in the other direction. That said, no need at all to have a perfect rectangle; it will work fine even if more of a blob. Hope that helps. Um- you posted this Friday, definitely made it Saturday, and am eating it for breakfast (with cream cheese and strawberry jam!) at this very moment. It is a keeper, lady! The dough is so easy to work with with the minimal kneading method, and it lacks the toughness of many 100% whole grain breads. And my dinner guests think I’m a genius, which is always a plus. Well done! Your line about having taken “too many melodrama pills” nearly caused me to snort coffee all over my computer, haha! Your post & recipe have made me nostalgic for cinnamon swirl bread… Alas, I might not be able to concoct a gluten free version of this bread…. But thanks for bringing back many childhood recipes of eating cinnamon raisin bread french toast at my grandma’s house. YUM! I am going to make this, sans raisins, soon! Will use spelt flour and some varying other flours and report back. I’m thinking of spreading it with cream cheese frosting? Also, where’s the picture of your own cinnamon swirl? I can’t find him! One question I didn’t see addressed anywhere – I have a tiny bit of Bob’s multigrain gluten-free cereal left over from when my autistic son was doing a gluten-free diet. (He seems to have outgrown his own gluten allergy and will love this bread – I’m excited to make it for his next visit). Is the cereal pretty much just for bulking up the bread and would therefore be OK to use here, or should I pick up some of the regular Bob’s mix so as not to impede the rise? Thanks very much! Deb, this bread looks fabulous! I cannot wait to make it (though since it involves the purchase of the 7-grain blend, may wait until “after Passover”–my husband’s refrain–at this point. Quick question re: the cereal blend. I love Bob’s Red Mill and use many of their products, but lately have found myself returning a number of things because of . . . shall we say, critters, residing in brand-new packages of quinoa or oats or whatever. Have you ever had this problem, or am I just having a run of bad luck?! PS–I will be making your macaroon cake again this year for the holiday–it was a HUGE hit at last year’s seder! Susan — No! But now I will be worried. I’d call them; I’m sure they’d like to know/make it right. Lucia — Mine is currently sliced in the freezer and we’re toasting it up as needed. It freezes just fine. I have recently acquired a passion for salted butter. So amazing the way that it can take the yum (and I can just see the yum in this bread) to the next level! I keep mine in a butter dish at room temperatures so that it’s ready for slathering. Deb, have you ever tried baking bread with natural leavening? I’m eager to give it a shot, but I can’t find a trustworthy formula, and it’s so laborious that I’m loath to wing it. Any thoughts? Ah, the inner toddler in all of us, wanting our food just so. :D I remember my mom would make us homemade ramen, but we would complain that it tasted nothing like the pre-packaged variety. Silly. Oh man, my sweet mother denied me so many sugary treats! I wasn’t so into raisins as a kid, but this bread has my full attention now. Looks like a great way to break in my new stand mixer. Made it last night. Delicious! We nearly consumed an entire loaf right out of the oven! We made with wheat flower and for my grain mis: rye and whole oats. Recipe was easy to follow – my 9 year-old and I did it together though we did a bit more kneading than called for just because. :) Thanks! I love this site (my favorite), your incredible humor and delicious recipes. Your cookbook is the one I reach for most often; truly, a source of inspiration! Although recipes using yeast tend to intimidate me, I’m eager to try this one as soon as possible. Made the Double Chocolate Banana Bread and shared with a friend. Delicious! Thank you for this. It looks phenomenal — I haven’t made bread in a long time, but that changes this weekend! Yum! My mother made Dutch Babies for lunch, so I got nothing to say. This looks wonderful! Deb! I made bread! And it was GOOD! Seriously, this is the first time I’ve successfully made sandwich bread (after too many failed accounts….). The bread is wonderful and the cinnamon raisin swirl is perfectly balanced. Thank you for helping me conquer (another) cooking hurdle. This recipe will surely replace our store bought sandwich bread in very short order, though I’ll be sure to do the cinnamon raisin version for Sunday brunch. One question – how do you store leftovers? One loaf is going in the freezer, but I’m curious how best to store the loaf we’ve cut into and will eat tomorrow. This recipe looks absolutely delicious. Can I substitute nonfat milk without compromising the recipe? I have a question about the whole grain blend. I make bread a lot and know that the ratio of flour to liquid is key to getting the right texture. Isn’t adding flour as part of the blend going to throw off the texture? (Ie: make it more dry) Or change from batch to batch if you use different amounts of flour vs raw grains? And likewise, wouldn’t adding cooked grains make the dough more wet? I’m very excited about this and just bought some 5-grain cereal to make it with, I’m just curious about the logistics. I don’t want to mess it up! Deb and Susan..I have had Pantry Moths and their larvae in packages from Bobs and trader joes.. And when they start..they infest Everything , including chocolate, as well as dried fruits and all grains… Everything has to be In tightly sealed containers..these babies eat through cellophane. “Do your own pest control”. They work. There..hope I helped, but now no one will ever eat in my home again! Oh man, that’s going to make me laugh for a long time. cake scraps are good for this. When I trim the dome off a layer cake, I’ll stick that in a bag in the freezer and take it out, and crumble it into my cinn-sugar mixture. Bread crumbs work well too. I will certainly try the egg, sounds ideal! I love this bread and you know why, because you are using whole grains. The second reason is that I love cinnamon bread. Yummy. Cheffzilla — I did not here. I find it can help with baked goods like cookies, where the raisins will be going directly from box to dough to oven. But here, it will sit in the moist bread dough proofing for another hour and they soften there. shweta — Don’t skip it, replace it with additional flour. Margaret — Yes, almond meal should work just fine. Eve — I think this would work fine with white flour. However, you might find that you need a touch less water. Kiley — Polenta does not to be pre-cooked. Larger grains (brown rice, bulgur, barley or whole quinoa) should be. Rectangle-rolling tips — See my comment response to Mandy in #102. Sara — You can use of a mix of white and whole-grain flours, or, as Liberty asked, use this half-wheat “light” wheat bread from 5 years ago with the same filling. Maral — Yes and no. It should work, but the rising times may be different. (Usually, I find Active Dry faster, but since Instant yeast is used here with warm water, it may not be.) You should move onto the next step when it looks right, and not just at the suggested times. Phin — I think you’ll be okay using it for the multi-grain portion, especially because he says you can use things like rice and quinoa, which are also gluten-free. Rebecca — No, it should be fine. But, bread baking is never an exact science. After you mix the dough, there’s a change to add more water or flour if needed if it’s too far in one direction or the other. Wife To An Amazing Cook — I store leftovers in the freezer. I find that bread stays the freshest there. Courtney — I have not made bread with natural leavening. Actually, I read the chapter on it in this book of Reinhart’s after someone left a funny comment last week about how she and her husband, in dealing with the stress and rigorous feeding schedule of a starter, realized they were not cut out for parenthood. So, I read the chapter and… yeeeeah; it’s not going to happen any time soon. Maybe next time I’m bored for a couple weeks? That said, I found it fascinating that you can make your own with nothing but flour and water or flour and pineapple juice. I do think it would be fun to try it one day. I made this yesterday! Followed the recipe exactly, which is hard for me and I rarely do. It was so delicious for breakfast this morning!!! Now I will have to try this recipe, too! Thank you! So for the quinoa or cereal or other whole grain that needs to be cooked, you measure out the amount called for of the dry and then cook as directed before adding it? Liz — He recommends going by weight, whether cooked or uncooked. That said, the recipe has dough checks built in so if yours is too dry or too sticky, you’ll have a chance to fix it. I am so excited to try this, and thanks to your suggestion with regard to Bob’s Mill cereal, I realized I had King Arthur Version– Pompanoosuc Porridge–that the kiddos don’t like as cereal but might ingest as bread! Love your site btw–it really helps when I need an idea for something new…cheers! this bread looks awesome. i will try to remember this story when my children beg for something. except when it’s something weird like frozen pancakes. or vibrant colored cereal. i just can’t do those…. Whole grain and yummy! Looks wonderful! This bread is AMAZING! I made one loaf with the filling and one without to test it both ways, and they’re both great. If you really want some nirvana, make the plain bread and add some Speculoos/Cookie Butter (from Trader Joe’s). Simply heavenly. Could not wait to make this! I used what grains I had on hand, rather than buying Bob’s Red Mill 7 grain cereal. I ended up using a coffee grinder to pulse 1/4 cup portions of buckwheat groats, barley, and quinoa (rather than cooking them) plus a few tablespoons of cornmeal and rolled oats. It was a great combination! I also subbed active dry yeast for instant yeast and used 2 Tbsp. It works just fine. YUM! Made this just as written except that I omitted the raisins to appease my raisin-hating husband. It was fantastic! I also agree with another commenter that I’ll probably up the filling a little bit next time. But WOW. Overall, it was fantastic. This cinnamon swirl bread is amazing! I hope I can have this for breakfast everyday. I didn’t have great luck with this bread (although it rose beautifully with very little kneading). I think it should be slashed before going into the oven, since I had a large interior bubble at the top. And a milk or an egg wash would make the crust less dry. But more important, mine just had very little flavor. And the swirls unswirled! That said, all other recipes I’ve tried from SK have been outstanding. Hi! I made this bread over the weekend, and I’ve only baked one loaf so far. My cinnamon swirl layer vanished! Any ideas on why the bread seemed to absorb the sugar layer? It did, however, make a wonderful just-barely-sweet multigrain bread, so I think I’ll purposely bake the second loaf without so we can have sandwich bread for the week. I made this with creamy buckwheat cereal from Bob’s Red Mill and rye flour in the proportions suggested in the recipe. It worked out great. I have an egg allergy so I also substituted for the eggs with 1 tbs ground chia seeds with 3 tbs of water for the egg in the bread, and 3 tbs milk with about 1 tsp of chia seeds for the egg wash (mixed with the 1 tbs of water). My swirl separated a little on the top so I think I might try mixing the filling with the wash next time. I also substituted roughly chopped crystallized ginger by volume for the raisins and it worked great. I made this today using KAF Whole Wheat Flour and BRM 5-grain rolled hot cereal (100g) and BRM quinoa flour (60g). I made 1.5 times the filling and omitted the raisins. It turned out great. Two things I did wrong. One, should have added more flour. I added a couple tablespoons but was worried I’d add too much. Also, should have baked a little longer. Temp was almost 190 but I had to get my kids down for nap. I think I might try to roll it a little tighter next time too. My 4 year-old loves it so that’s a win! Thanks Deb. This is such a great idea, I love cinnamon swirl bread. I make homemade bread often and can not believe I never thought of this. Great job it looks fantastic! Wow! So beautiful. I love whole wheat bread! Soo good! My daughter (7) and I made this recipe as a breakfast loaf for Spring break. We didn’t have any raisins but instead used figs, dates and chopped apples, holy moley it was delicious! thanks for the terrific recipe! This looks delicious and I look forward to trying it, but that seems like really a lot of yeast. I have never used instant yeast and plan to use active for this recipe, but is there a reason that so much is necessary? Anna — It seems like a lot for two reasons. 1. This makes two large loaves. 1 1/2 teaspoons per loaf isn’t terribly high. 2. So that the bread can be done in just a couple hours, if desired. When making a dough that you’d ferment for 6, 12, or 24 hours, you need very little yeast, comparatively. Hope that helps. I made this without the cinnamon swirl to make a whole-grain sandwich bread, like you suggested. Then I used the bread in grilled cheese sandwiches and served it with your cream of tomato soup. I felt like I was trying to get Smitten Kitchen extra credit! It was delicious. I’m going to make the other half with the cinnamon swirl for Sunday breakfast. Thank you as always! Help! I made this, being careful to follow your recipe as I have had a few bread fails recently.. I am kinda new to breadmaking, and have a new toaster over with Steam – Cuisanart Combo CSO-300. I made the dough one night, was happy with the rise. Fermented in the fridge for a few days – in a bowl covered tight with saran. The other night I was ready so I pulled it out, separated into two – I think I may have actually punched it down? definitely kneaded the loaves before rolling. Proofed in the oven with 100 degree steam, then baked on the bread function following the recipe. Two things went wrong.. It didn’t really rise again with the proof or with the bake. It puffed a bit more, but not too much, so we have a really dense loaf. Which is fine, but then the second thing that went wrong.. Not enough salt.. I have you cookbook and remembered you writing that when you say Kosher salt, you use Diamond Kosher salt. So I did the recipe measurement with that. Was that the problem with too little salt? Did I get that wrong?? Love this site & your book, by the way! Thank you!! Stephanie — Sorry, I know nothing about steamer toaster ovens. The salt shouldn’t affect it (I rarely find Diamond brand anymore). How many days was it in the fridge? Did it seem risen or collapsed when you took it out? Thanks for the quick reply, Deb! I’m sure that was the issue then with my low salt taste.. (the Diamond vs. other brand issue).. It was in the fridge for about 2.5 days.. it was risen a bit when I took it out, definitely. I wouldn’t say a lot though; it definitely had a lot of air in it. I wonder if the punching down, extra kneading was the problem? Or maybe my yeast wasn’t that reliable? Where do you get yours from? I bought this packet (active dry) from a smallish grocer that very possibly does not sell lots of yeast..
I’m going to try again next week! Still enjoying the dense loaf, but really looking forward to a lighter one! “tasted like sad” I’m still laughing about this. Side note: I made the jacked up banana bread — without rum — I definitely need four bananas because I LOVE banana flavor, but this is SO. GOOD. Love your site. Made this twice, and first time was fabulous. Second time I was 4 days postpartum, overwhelmed with company and let it overproof – tasted good, texture was totally off. And totally my fault…. This bread was absolutely delicious! The friends I shared it with rolled their eyes and sighed after taking a bite. I also made this bread with the substitution of almond milk, so my lactose intolerant mother could have some. I will definitely be making this again. It is a great breakfast, because it’s not too sweet and has all those wholesome grains in it. 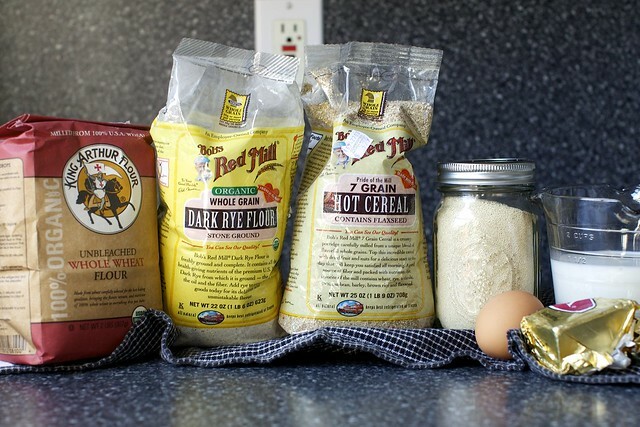 (I ground up a 4-grain hot cereal mix from Trader Joe’s.) Thank you! I made this cinnamon swirl bread today using all white whole wheat flour (about 6.5 cups, plus 9 tsp gluten). The dough was luxuriously soft. I made one regular loaf and three mini loaves to gift. The bread smelled heavenly as it baked. They baked perfectly to 190 degrees in 40 mins. I lightly covered them with foil for the last 20 mins to prevent over browning. I brushed the loaves with butter as soon as they came out of the oven. My daughter and I just enjoyed the first slices, and they were absolutely delicious! Thanks for the recipe! I made this today (with substitutions) and it is delicious! A definite keeper of a recipe. I used all AP flour because that is all I had. For the whole grains I used all rolled Quaker Oats because, again, what I had on hand. I can definitely see that the bread would have more depth of flavor with whole wheat flour or other grains so I can’t wait to make it again with different flours. Also, all I had was one lonely kid-sized pack of raisins so that’s all I used, but I will use the full amount next time because some of the best bites have the raisins in them. Finally, I used two packets of yeast (just under 1.5 TBSP) and let it rise a bit longer to make up for the lesser amount. I am away from my mixer and had to mix by hand (seriously, my arm almost fell off) and while it seemed sticky-not-wet in the bowl it was a seriously gooey mess on the counter. I just kept adding flour as I kneaded/rested and it turned out perfectly. Ready in 35 min at 350 in my convection oven, cooled off quickly and my kid is already eating a piece fresh from the toaster. Thanks, Deb! I only had active dry yeast, so I followed the instructions at the Fresh Loaf (http://www.thefreshloaf.com/faqs/baking/yeast) to substitute active dry yeast for instant yeast. That worked out to 1 1/2 Tbsp. + 1 tsp. of active dry yeast, which I proofed in the water with the sugar, and then added to the milk. From there I proceeded as directed with white whole wheat flour. I thought it worked well; the bread was light moist and not overwhelmingly sweet. In class right now trying to figure out what I should cook for class assignment. I like cinnamon but I don’t know if this is challenging enough to convince my teacher. What kind of milk? 2%? Brit — You can use any kind. Whole is always tastiest in baked goods but low-fat should be fine here. Thank you! Breads in the oven however I just realized I used 13 grams of instant dry yeast and that is wrong :/ I’m sure we will still eat it. Not sure of the difference. Great recipe! Printed this off the day you posted it, saving it to make with spent grains from my husband’s beer brewing. Worked exactly as we hoped. I used 100g spent grain which was exactly 1 cup. And rye flour, rolled oats and wheat germ to make up the other 60g. Thanks!! Awesome. I have a multigrain hot cereal that might work in this if I can get out from under a baby long enough to cook anything! Hi I hate raisins, so I omitted them, but had trouble getting a noticeable, visible swirl with just cinnamon and sugar. Bread was delicious though! Any tips for making a nice raisin/dried fruit-less swirl? Definitely want to try this bread. Really like the idea of chopping the raisins. Growing up my mother made bread and churned butter a lot. I always loved it when she would buy white bread and margarine. All I can say is I was young and stupid back then, although I do love my cucumber sandwiches on soft bought bread. When I was little the only time we had cinnamon swirl bread was at my Grandma’s and as we live in England and she lives in the States we weren’t exactly popping in every weekend. When I put a slice of your cinnamon bread in the toaster our kitchen smelled just like my Grandma’s used to when she made me cinnamon swirl bread toast – thank you so much. This is a wonderful sort of recipe – sustaining, pretty healthy and a real treat. I made this again today, this time sans swirl. It makes the most wonderful ww sandwich bread and I’m so pleased that our bread for the week is coming out of the oven instead of the grocery store. I didn’t have enough of the flours as the recipe is written, so I used some whole wheat bread flour, some whole wheat flour with the germ and the last of the Bob’s Red Mill cereal leftover from the first time I made the cinnamon bread. And I also used soy milk as I was out of cow’s milk. And even after all that, the bread is wonderful. I really appreciate this recipe so much — it’s made it possible for me to successfully make bread, something that has eluded me for a long time (despite many attempts to try and simply get close to just “ok” loaves). Thanks Deb! This recipe gave me 2 perfect loaves yesterday. I used multigrain bread flour for the whole grains and omitted raisins and also used 2% milk. I think I’ll increase the cinnamon mix next time, would like more cinnamon. This was amazing. I’ve never had whole grain bread turn out so well and beautiful the first time around. I just made it last night, and already have another batch rising to gift to friends! The bread proofed significantly faster than expected (but I have no AC and it was well over 80 and humid in my kitchen) so I suspect that was nature rather than anything else. I used the Bob’s 10 grain porridge mix, and it was perfect. Thanks Deb! I just made these yesterday and they were wonderful, however whilst kneading the dough I did find it really sticky so I added some flour (not a lot, didn’t want my bread to be tough) it was all good until trying to put the dough into the pan. The dough was waaay too soft. Even after I proofed the dough (final proofing) the sides fell/sunk as if the dough was too weak, sadly they fell even more in the oven. Any ideas on what went wrong here? Hi Patcha — Can you tell me about the flours you used? It’s possible that the grain mix didn’t absorb as much as mine has. I halved the recipe and made 1 loaf, I used hard whole wheat flour for the flour and my whole grain mix consisted of mostly rye flour, a little bit of oats, cooked rice and toasted wheat germ which I blended in the food processor. Thanks! I made this recipe today and the loaf came out perfect! I only did a few things differently. I only wanted one loaf so I halved the recipe. I also substituted about 60 grams of the whole wheat flour with all purpose flour and added a little cinnamon to the dough, itself. I soaked my raisins before adding them to the dough, and I like them whole so I didn’t process them. I know the bread would’ve been just as delicious without any of my changes. I will definitely be making this bread more often and using it as a sandwich bread and a toast bread! Hi Deb! I plan on making this bread again but I had a couple of problems last time. Whilst kneading the dough it was really sticky so I added a little flour. I couldn’t put the dough into the pan because it was too soft. Even after I proofed the dough (final proofing) the sides fell/sunk as if the dough was too weak, sadly they fell even more in the oven. Any ideas on what went wrong here? I halved the recipe and made 1 loaf, I used hard whole wheat flour for the flour and my whole grain mix consisted of mostly rye flour, a little bit of oats, cooked rice and toasted wheat germ which I blended in the food processor. 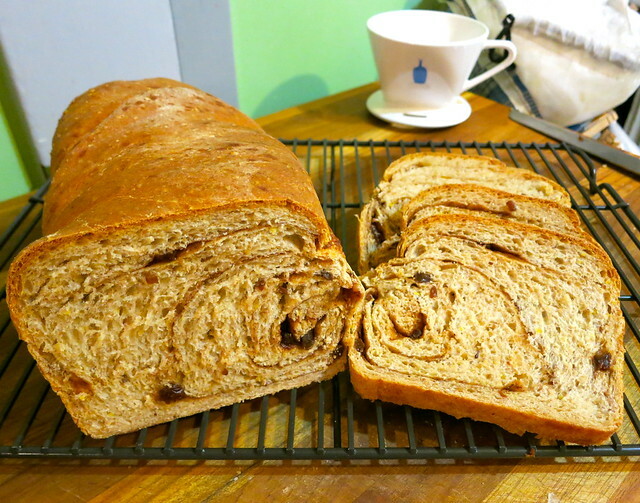 I just made this recipe, and did it with a twist that might be useful to others: Use all of the cinnamon raisin filling on ONE of the loaves, and leave the other one swirl-free to use as a sandwich loaf. Excellent recipe. Thank you so much! onix — Yes, I find most cups of flour to fall between 125 and 130 grams. I just discovered your whole wheat and oat bread and it was gone in less than 24 hours. Do you think I could use the cinnamon mix in that bread dough? Dawn — Absolutely. They’re similar recipes, same source. I have been making the recipe with the same mixed grains Deb used since it was published, and our family (2 adults and 2 kids under 5) loves it. It hasn’t been as popular without the cinammon swirl, though; it can be a bit dry. We often use it for French toast. A few days ago, I didn’t have the 7-grain hot cereal and I made it with leftover cooked wild rice. I also added 5 tablespoons of vital wheat gluten. It was soft and fluffy and not at all dry. It’s a lot less complicated than our regular sandwich bread, which is Peter Reinhart’s Multigrain Bread Extraordinaire, and which is not 100% whole grains. Thanks for a great recipe, Deb. I fell in love with this pretty bread and tried to make it tonight for Christmas morning tomorrow, but I think the recipe is so strange. It can’t possibly have enough liquid (or maybe it’s more butter that it needs?) and kneading for 10 minutes on a stand mixer seems like so long. Anyways, I made it to the first rise and stuck it in the fridge hoping maybe a long rise will help my dry, possibly overkneaded dough… But I’m not very optimistic. Do you have any ideas for good recipes that I could shape into this pretty star shape? I wish I could use your babka recipe but I imagine it would be too soft. Maybe this cinnamon bread recipe? I noticed a typo – there’s a repeated word in the bread proofing paragraph. It says “until it has crowned about about 1-inch”. Just now eating a yummy slice with butter. I followed the recipe, using honey, pink himalayan salt, rolled oats, butter, and whole milk since we’re snowed in and that’s what I had on hand. Baked to 190 at 50 mins, it’s 27 degrees and snowing outside, I also opened the oven more than I probably should have to check temp and tent with foil. For anyone interested, I made this vegan by using flax egg and homemade hemp/coconut milk. Delicious. I tried this today. I used a 7grain cereal and the rye flour as Deb did. I made the two loaves and left one plain. The raisin was the best. I think next time I will divid into 3 loaves. I also brushed the egg wash on top and sprinkled a tad more cinnamon sugar on top. It was awesome. Love this recipe! Would the filling me okay without raisin (or any other type of dried fruit?) If so do you recommend increasing any of the other filling ingredients? Thanks! For the whole grains, Can I use 160g of all rolled oats or all amaranth ? Chpl — Yes to oats, but I haven’t worked with amaranth to know if it’s a good swap. If you have before, you’ll probably be fine here. I made this yesterday and it turned out wonderful! I was a bit nervous as I had made the wheat bread from Reinhart’s Bread Baker’s Apprentice and was disappointed. (But the multigrain bread is divine!) I will make this again. But everything I make of yours turns out great for me! Congratulations on ten years of blogging! You are my favorite food blogger! Keep up the great work! You might want to rearrange the list of ingredients. The last item under ‘Filling” … “1 large egg beaten with 1 tablespoon water” is not for the filling. Unfortunately I took the list at face value. Perhaps list it under it’s own heading, maybe ‘Other’. Wait — it is but it’s not. It’s to brush on the roll before sprinkling the filling. Did you mix it with the sugar? Did it still come out? Regardless, I’m sorry for any confusion. I am really excited to try my hand at this bread! Do you think it would work to substitute agave nectar or honey for the sugar in the filling as well as the bread itself? Thanks! – I used white whole wheat flour and whole grain oat flour (I just food-processed old-fashioned rolled oats). I would have used a wider variety of whole grain flours if I had more on hand. It came out superbly. Like really, really good. Sweet (even though I cut the sugar in half), and super moist. Yogurt does wonders in baked goods. I am looking for a 7-grain cereal that is organic and non-gmo. Would the Bob’s 7-grain pancake and waffle whole grain mix work in this bread? The other option is the Mulberry Lane Farms 7-Grain cereal, but I read through those comments and it said that they dont cook up as soft as they are used to which resulted in a bit more of a crunch. I know my kids want nothing “crunchy” in their bread. Maybe cooking them super soft might be a way around that? Not sure what else is in the waffle mixes but if there’s baking powder, I wouldn’t do it. I still use the 7-grain hot cereal mix for breads like this and a new one I’m developing. No lingering crunch. I tripled the raisins and loved it! Can I make this without Raisins? Or should I sub a walnut/pecan? You can make it without raisins. You can add nuts if you wish. This looks delicious! Do you think the second loaf would be freezer friendly? Thanks for the recipe! For those with raisin adverse family members, I finally found that golden raisins work well. The kid apparently just did not want brown things in his food. He is now an adult and I don’t think he has figured it out yet. I do all yeasted bread dough kneading in my bread machine on dough cycle. Would you recommend any changes? I’m sorry, I’ve never used one but if it works for other breads, don’t see why it wouldn’t here. I made this bread this weekend and it was a huge hit with my 1-year old twins and my wife. I bake bread regularly and my wife said this was one of the best ones I’ve ever made. That’s a huge compliment especially since it’s 100% whole wheat. For the whole grains I used oats, quinoa run through the spice grinder, and ground flax. I reduced the sugar in the filling slightly and it was still sweet and delicious. I used the extra egg from the filling to give a double egg wash before and after the final proofing, which helped give the final bread a nice golden shine (I learned that trick from the smitten kitchen challah recipe). I made this the other day and it is fantastic! Do you think you could just omit the cinnamon part to make plain whole wheat bread? I wonder if it would work. Yes, or you can use this or this. I made this using 2x cinnamon mixture and it was awesome! I’m thinking of trying to do a savoury version with cheese and Vegemite (yes, I’m in Australia and this is a thing – a delicious thing, as gross as it sounds!) but wondering if the dough would still rise if I omitted or halved the sugar in the dough mixture… Any thoughts? Made this beautiful and delicious bread last night!! I used the Bob’s Red Mill 10 grain cereal because I couldn’t find 7 grain. I will be adding this recipe to my collection to make again. And again! If I am freezing the second loaf, should I slice it first or freeze without cutting? Absolutely up to you but if you plan to use it in slices — i.e. some at a time, leaving the rest in the freezer — best to slice it first. Can you substitute active dry or fast rising yeast for the instant yeast and if so, what would you recommend for proofing the yeast ?